Driving an hour to Venice Beach to meet a complete stranger is kind of a crazy thing to do, but if you've ever read Kelsey's blog, Kelsey Captivating, you might understand why I didn't give it a second thought to do exactly that on Saturday. Kelsey and I have been following (read: stalking, in my case) each other's blogs and social media accounts for quite a while, but we unfortunately missed each other during her short time living in LA last year. So when I saw that she would be visiting SoCal for a few days, I jumped at the chance to meet up with her. I ended up meeting her and her cousin Jesse at my favorite coffee shop in Venice, Le Zinque, and had seriously the best conversation with them for a few hours. It's always a little daunting meeting bloggers in person for the first time, but Kelsey was so easy to talk to, and I felt like I had known her forever. It was kind of amazing how comfortable it was to talk with both her and Jesse about everything from TV shows (obviously) to even politics and religion. It was such a wonderful evening, and I sincerely hope Kelsey is able to move back her like she's talking about so that way we can hang out more. 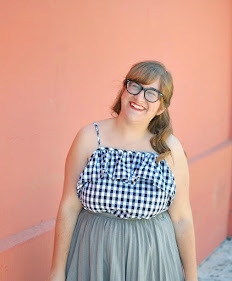 In the meantime, I cannot recommend her blog enough, especially since Kelsey might quite possibly be the cutest person on the planet. I just adore her style, and and she's so genuine and sweet that it's basically impossible not to like her. We also made sure to snap some outfit pictures after coffee, and Venice made best backdrop. This skirt is quickly becoming one of my summer staples, and it felt perfect for the area we were in. I also really love how great this dress works as a top. I am just really digging dressing for summer this year, you guys. I kind of went a little photo overboard in this post, but I just loved all of these too much. I can't wait until Kelsey posts her outfit from this day on her blog because I'm just a little bit obsessed with the photos we took of her. It's not creepy, I swear. I hope everyone else had an equally as wonderful weekend! I can't say that I did much for the Fourth other than working and hanging out with a friend, but it's never really been my favorite holiday. Hopefully you all did things that were more exciting. This outfit is so cool! I love the skirt and the necklace and everything together. You look really really stylish in this! This is such a cute outfit! I especially love your top ad bag (: and, how exciting that you got to meet a fellow blogger! That's something I've always wanted to do for sure. There is something I really, really love about this outfit, and something about you looks different. I can't decide if you've had a haircut or what but there is an air of confidence and... I don't know, self possession, adultness about you in these, especially that first photo. Go glad you enjoyed meeting another blogger! That fox tote!!!!!! I neeeeeeeeeeed it. You are too cute lady. I wish I could manage as many fellow blogger meetings as you've been doing lately! I think I've met maybe 1 blogger to date! I love your outfit! It has a relaxed and uber cool vibe! I'm glad you had fun! Meeting other bloggers is the best! That's so cool that you got to meet up with her. I've only ever met one other blogger in real life but it was a very fun experience! Also you look super cute, as always! Love the grey pleated skirt and your classy summer sandals. Love this whole outfit, you look amazing! I especially love the adorable tote and the pleated skirt. Meeting other bloggers is so fun! That is such a cute outfit- that skirt and bag is super cute! :D Oh, wow, I can't wait to meet bloggers in person- it definitely sounds a little nerve-racking but also really fun! Glad you enjoyed your meet with Kelsey! There is something awesome about meeting fellow bloggers, all the awkward intros get skipped and you can just get to the good coffee and good convo. Also that's a seriously awesome tote bag! I think you just inspired me to reach out to a few DC area bloggers this summer - that must have been super fun! And I have soooo much love for this outfit! I really like your "top" - Pairs perfectly with that skirt! I actually thought it was a crop top at first! Love it! You look so happy! How fun... a little road trip with a sweet lady indeed. I just love her style and you look adorable as ever! Fun post! ahh love your bag and necklace :D you are so cute! I seriously love this is outfit, I think its my favorite that you've posted. That skirt was a great find! Also thats so cute! Ive always thought it would be fun to do a Chicago meet up because I feel like I follow quite a few ladies who live in the same city as me or at least also the midwest! I guess its just intimidating to essentially meet strangers. Plus Im so bad at small talk. Aww you guys are adorable! I'm glad you had fun! I've never been to Venice but it sure looks fun! these photos really are lovely! isn't it great taking pictures with another blogger that just "gets it?" I would have posted them all too! so glad you two were able to meet in person and hit it off IRL. the dress is lovely as a top! these photos really are lovely! I would have posted them all too. isn't it such a relief to take photos with another blogger that just "gets it?" so glad that you two were able to meet IRL. and this dress is lovely as a top! I've never met another blogger irl and the thought actually terrifies me. Maybe one day I'll get over it! Sounds like you had a lovely time and these photos are just perfectly summery.